This personalised best dad presents frame makes the perfect gift for fathers day or any special occasion. If don’t have a gift for your Father this frame makes sweet fathers day gifts for your Father on his Birthday, Fathers Day, or any other special occasion for any deserving Father. It measures 8inches by 8inches approx is handwritten, handmade and professionally made in the UK! It can hang from any wall, door or any other possible place you could hang a frame from, with the natural twine which is included. E.G. 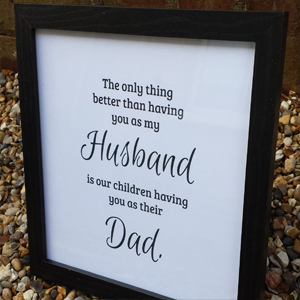 is Ollie and Oscar having you as…..
Our ‘The only thing better than having you as my Husband is our children having you as their Dad’ personalised Print and Frame makes the best dad presents for Father’s Day, birthdays, or just as a special gift to tell him how much he means to you. You can even make your gift more unique by changing the words to make it personal and more meaningful – it’s sure to be a treasured gift for years to come. Production time – it takes 2-4 days to create our plaques/prints for you.